Our Caveman figure comes dressed in a shaggy (replica) animal skin and leaning on a staff. 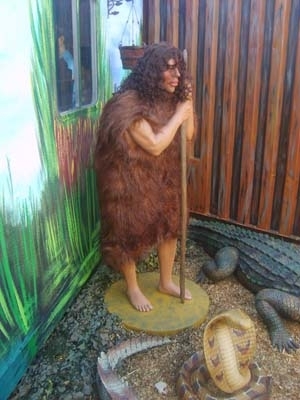 This model is a depiction of most people's idea of a brutish Caveman. 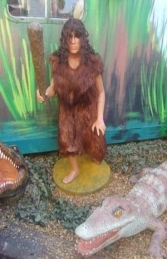 Ideally suited for a prehistoric display, our life-size Caveman looks great with his club wielding Cavewoman (JR 2348) in against a rocky cave back-drop or snow scene. We have many animal models, such as the Puma, Bear & Mountain Ram models & the Animal heads, which also combine well with these prehistoric characters to give a great Ice-Age theme. PLEASE CONTACT US ON 01626 833646 or 07860 680181 TO DISCUSS THIS MODEL & THE OTHER FIGURES IN OUR HISTORICAL THEME SERIES. PLEASE PHONE US TO PLACE AN ORDER & FOR A QUOTE FOR DELIVERY COST TO YOUR POSTCODE.